And, sometimes no matter how hard you try, it will end up impacting your business in a not so positive way. We’ve all been there. Everyone will have problems, there will always be an issue, but in the end, it’s how you take care of it that matters. Now, we think (no, we know!) we’ve uncovered an effective way to keep those negative issues to a minimum – a strategy we’ve successfully put in place in both of our businesses – and we’re excited for the opportunity to share that with you. 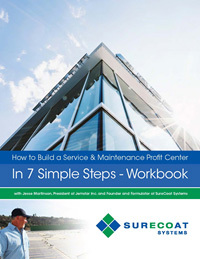 In this 35 minute webinar, you will learn not only how Jesse Martinson, founder, and formulator of SureCoat Systems, developed this program, but the methodology behind this program. How each step of the process works, why it works so well, and how it’s kept SureCoat billing millions in jobs since the very beginning. Are you looking to build strong, ongoing relationships with building owners and facility managers? How about looking to get paid to inspect and then service roofs continuously year after year? Or, maybe want to redefine or build a completely new service and maintenance program (aka profit center) in your business? If you said YES to any of the questions about then you are in the right place. OR, coming to you when they are looking to purchase a new property or building because you are a trusted source. You know what to look for, you know how to look for it, and you know how to solve those roofing maintenance issues for good. This is a specialized training just for you if you finally want to create a foolproof service and maintenance plan that will produce real results for your business. It’s Time. This is 35 minutes of your day you won’t regret using to build your business. Viewing Tip: Don’t miss the killer Q&A at the end. The contractors who joined us live brought great questions to the table, including a few of the same things you’re probably thinking about right now. And, if you don’t get your questions answered, please give us a call at 877-BE SURE or email us at info@surecoatsystems.com, we love answering questions and solving your toughest challenges. 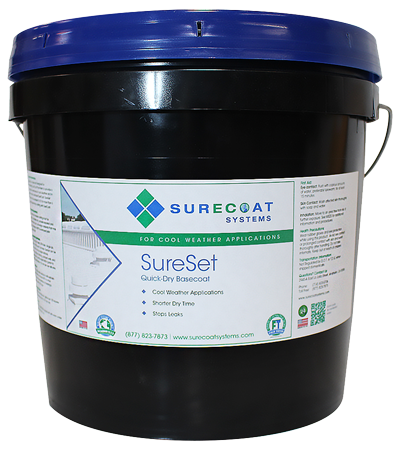 Get your hands on SureSet, our quick-drying roof coating that cures within 2-12 hours. 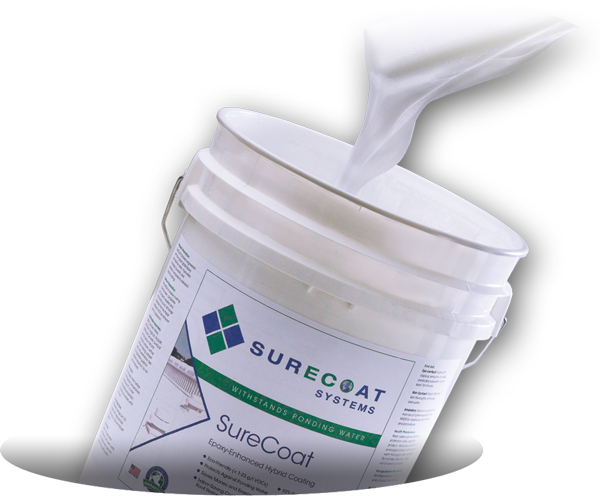 Engineered with the same high-grade raw materials as our other SureCoat roof coatings, SureSet also applies right over existing surfaces, no tear-off required. SureSet is a reflective and thermal emitting Title 24 Compliant roof coating. Perfect for that extra leak protection all year round. With a curing time that quick, you’ll have a whole bunch of roofs repaired and set before the day is over. Best part? Customers will be calling you back to finish their WHOLE roof. Get SureSet today! But wait! Before you press play, make sure you download this workbook we created specifically for this webinar. It follows along with the presentation keeping track of the step-by-step process of the program with spaces to jot down extra notes, thoughts, and questions throughout the video. All to help you get your own service and maintenance program in production as soon as the webinar ends! Bonus Download! Text “SURECOAT-TEMPLATES” to 44222 to gain access to the Word templates that we use for OUR service and maintenance program – yes, that’s right the very same templates we’ve used in our program, you know, the one that’s helped us bill millions in jobs since the beginning. SureCoat is our uniquely formulated waterproof coating system that stands up to the elements including UV radiation, ponding water, wind-driven rain, pollutants, mold, mildew, animal fats, and most chemicals. We have performed countless case studies and monitored the life of our product’s performance over a decade at different installations in diverse climates, and we know our liquid single ply works. 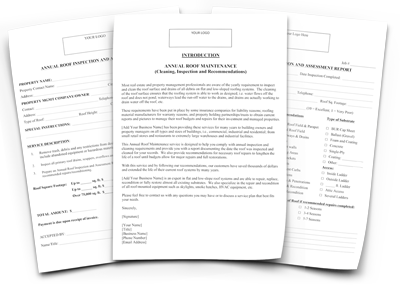 Why else would we offer a clear, no-nonsense 10-20 year written warranty that you will never have to use? It’s time to become the proven roofing solution! Need 10 More Reasons Why? Here’s a list you won’t want to miss. 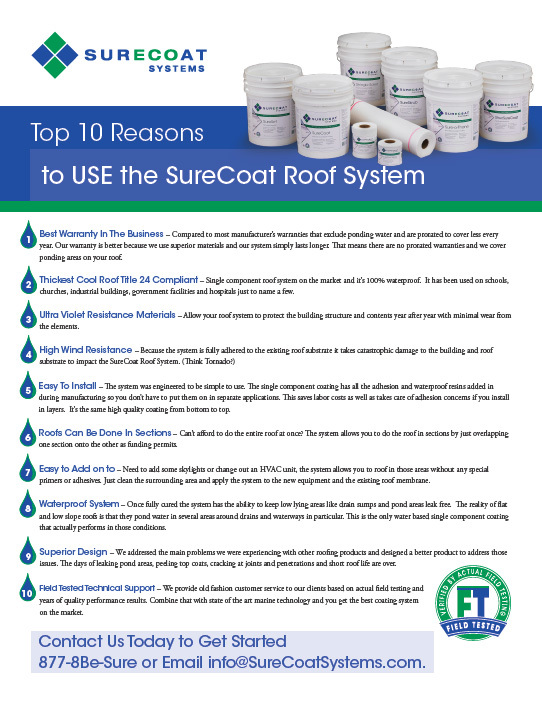 Jesse’s top 10 reasons to use SureCoat meets every contractor’s list. Check it out for yourself. We hope you love this webinar as much as we loved putting it together for you. THANK YOU for taking the time to tune in. Again, if you have any questions, comments or concerns, please don’t hesitate to reach out to us. Our team is on standby to help you and your business succeed.